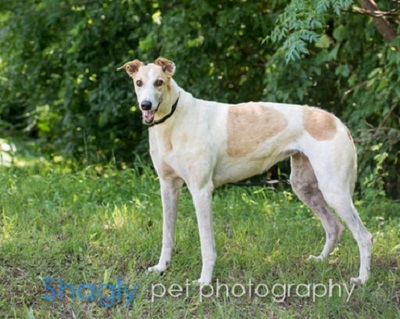 Lolly, aka MRL Killin Time, is a 5-year-old white and red female born March 12, 2010. Her sire is Hallo West Acre and her dam is MRL Generation. Lolly has 117 races on record, all at Orange Park in Florida. She started her career in November 2011 and finished it in September 2013. Since then she has been at a breeding farm, but has had no puppies that we know of. She is sister to Kaboom. Lolly has passed an initial cat test and is living in a home with a cat and small dog. For those seeking a big dog with big personality, look no further! Lolly adjusted to her second foster home in no time at all and shows no shyness around new people and dogs. While five years old, she still has an almost puppy enthusiasm for life sometimes. But she is still a greyhound and she sleeps like a champ, roaching on her back with or without a dog bed. Her signature move is to stretch out her front legs and rest like a sphinx on her hind legs. Her unique mohawk-like cowlick certainly distinguishes her from the crowd! Plush toys make her eyes bulge and tail wag, so you'll need robust chewables to survive her lust for the squeaky toy. Her enthusiasm sometimes means pillows and blankets get a little chomped in the excitement. Lolly's part-time hobby is counter surfing when no one is looking. Even a couple of minutes can be enough time for a slice of pizza to disappear off the kitchen table. But she's very intelligent and will soon learn the house rules. 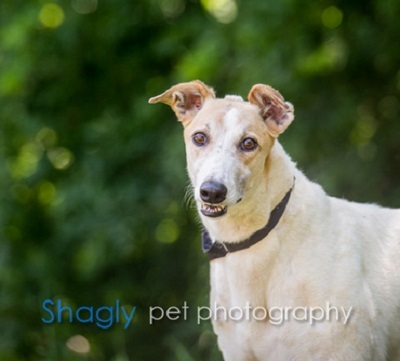 With Lolly, you'll immediately notice her love of attention and see her gently nudging her long nose on top of other dogs in a quest to get more attention. She does play nice with other dogs, though I've seen her growling at her reflection while eating a few times. In Lolly's previous foster home, she was living with a cat and Chihuahua, so she can be considered cat-friendly. Lolly is definitely cat-curious though, and while walking you'll need a tight grip on her leash when she spots squirrels. Lolly would probably do best with the stimulation of other dogs around.